The US has been a key market for the Mexican low cost airline Volaris since the company launched transborder service in 2009, reflected in the more than 23 US markets the airline presently serves. For many years Volaris’ transborder push originated in other bases outside Mexico City, given slots constraints at Juarez International airport and previous caps on the number of airlines serving transborder routes from Mexico City. But in 2017 Volaris is entering more contested markets, taking advantage of a new US-Mexico bilateral that lifts restrictions on the number of airlines operating on some routes between the two countries. It is upping competition with its Mexican rivals Aeromexico and Interjet on services from Mexico City, as well as with the large US global network airlines. It is not clear if the routes will absorb the additional capacity added by Volaris, but the airline will be the only ULCC operating on those routes, betting it can stimulate traffic with its ultra-low cost model in the already crowded markets. Although Volaris has branched out with service to Guatemala and Costa Rica during the last couple of years, the US remains the airline’s largest market, and Volaris believes ample opportunities exist in the transborder space. The US represents 93% of Volaris’ international seat deployment and the airline operates to more than 23 markets in the country. Volaris’ international passenger growth (driven by its transborder routes) increased 34% year-on-year in 2015. 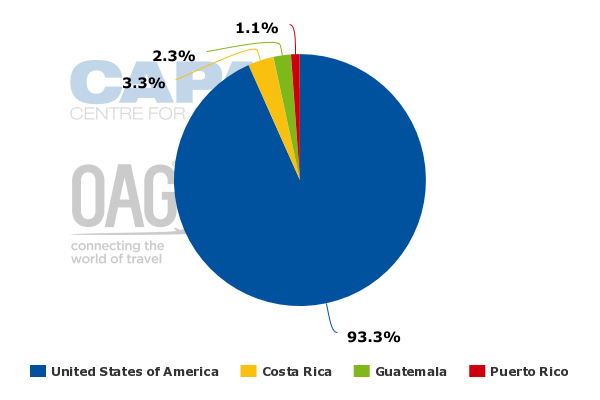 Source: CAPA - Centre for Aviation and Mexico DGAC. * Year to Month indicated. 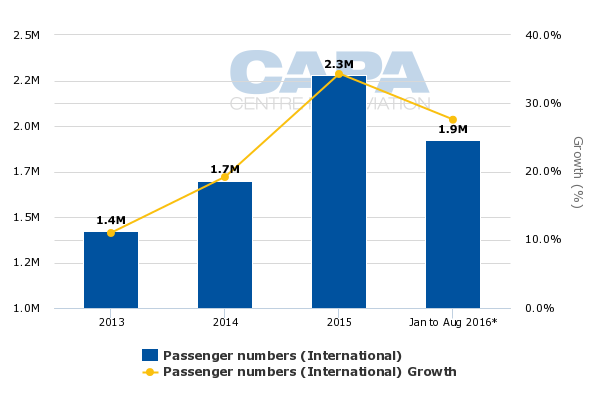 The airline’s international passenger growth has continued in 2016, with Volaris posting double-digit growth every month for the 8M ending Aug-2016. Among Mexico’s airlines, Volaris held a 25% international passenger share for the 8M ending Aug-2016. 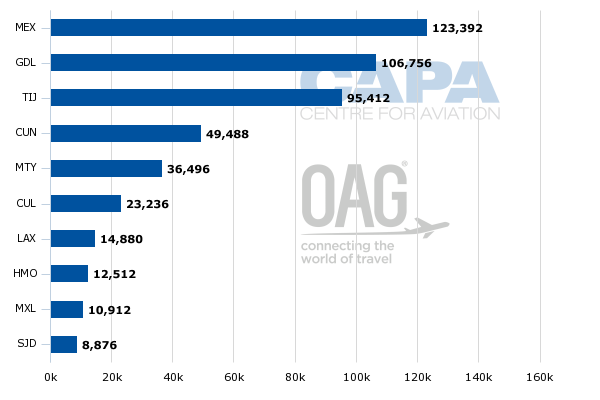 Mexico’s airlines bolstered their international passenger numbers 14% year-on-year during that period – to 7.5 million. However, international passengers transported by Mexico’s airlines represented just 28% of the total 19.2 million international passengers carried by all operators to Mexico in that eight-month timeframe. Much of Volaris’ US transborder push has occurred from its second largest base measured by system deployment – Guadalajara. Due to slot constraints at Mexico City, along with previous restrictions on the number of US and Mexican airlines operating on transborder flights from Juarez international, Guadalajara represents Volaris’ largest base measured by international seat deployment. Volaris has also targeted a different passenger sector in the US transborder markets, focusing on VFR (visiting friends and relatives), targeting passengers that travel by bus between the US and Mexico, with more point-to-point markets outside Mexico City. As a result, Volaris is shielded from high levels of competition on many of its US transborder routes. On five of seven transborder routes that Volaris has launched in 2016 it is the lone operator. Volaris regularly stresses that numerous opportunities remain in the US transborder markets and many of its routes are demanding more capacity. The bulk of Volaris’ planned 17% to 19% capacity growth for 2016 is targeted toward international routes. *Service to San Francisco began in late 2016. 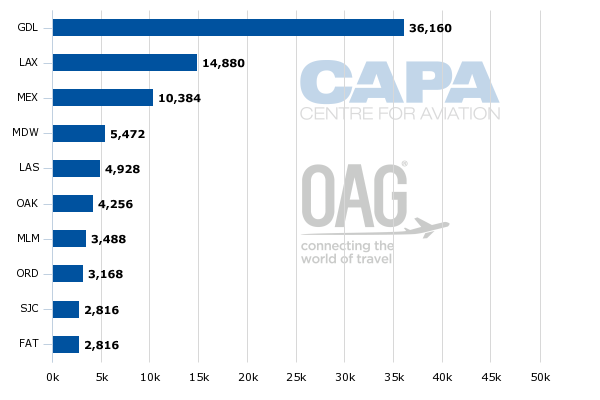 Data from CAPA and OAG for the week of 17-Oct-2016 show that Volaris is joining its Mexican rivals Aeromexico and Interjet on flights from Mexico City to Miami, New York JFK and Houston Intercontinental. Volaris is clearly taking advantage of the lifting of the restrictions of the number of Mexican and US airlines operating on routes from Mexico City to the US, and is also upping competition with the US global airlines American, Delta and United. The obvious question for Volaris is whether those routes will absorb the additional capacity from Mexico’s ultra-low cost airline. Aeromexico is the country’s only full service airline, whereas Interjet operates a hybrid model – targeting a slightly higher-end passenger than Volaris, which adopts a pure low cost model. Volaris is likely betting that it can stimulate traffic in those larger markets, similarly to the strategy adopted by the US ULCCs Spirit and Frontier with their push into larger US metropolitan areas. However, in the mature US market the country’s four largest airlines – American, Delta, Southwest and United – are fighting back against ULCCs. American, Delta and United are all in various phases of adopting segmented fares to attract the customer segments targeted by Spirit and Frontier. Different market dynamics apply to the less mature market of Mexico, reflected by Volaris’ ability to stimulate traffic in its transborder markets. But some of Volaris’ new routes are highly contested, and price matching by its competitors is likely to occur. However, with the lowest unit cost excluding fuel (USD4.7 cents for 1H2016) of any airline in the Americas, Volaris has the staying power to offer lower base fares in those markets for an extended period of time. Volaris’ international push from Mexico City is likely to be limited, given the slot constraints at the airport. In order to gain approval for their planned transborder joint venture from the Mexican government, Aeromexico and Delta have had to relinquish eight slot pairs at Juarez International; but it is not clear how those slots would be allocated. Volaris’ expansion into more contested international markets from Mexico City is a natural evolution of its strategy. Although enticing passengers to switch from bus to air travel is a core element of both its domestic and international strategy, Volaris also believes it needs to inject some form of low cost competition into more contested markets. 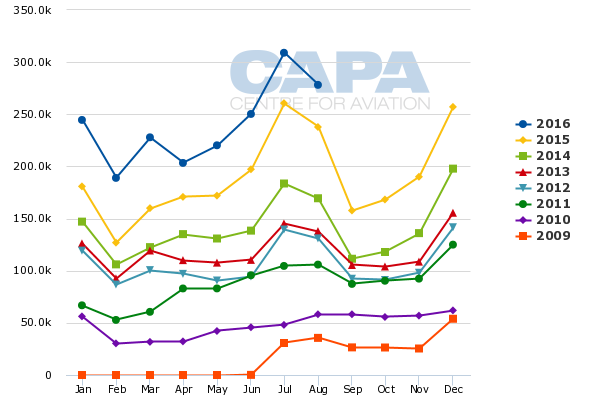 As the situation develops Volaris is likely to lean more heavily toward less competitive markets in order to grow its VFR traffic base, which it believes is less vulnerable to cyclicality. Volaris has been less vocal about the opportunities created by the lifting of restrictions in the US transborder market than some of its Mexican rivals. But its latest transborder route additions show that it intends to capitalise on opportunities created by the more liberalised air services agreement between the US and Mexico. Its push from Mexico City results in a true ULCC competitor on populated routes, including Miami and New York JFK. A key driver of Volaris’ success in those markets is its ability to keep fares markedly lower than its competitors, driven by its enviable cost base.